After having about 2 weeks of temperatures around the 36C ( approx 100F) it was great to wake up to some overcast skies and cool detecting weather finally. I have been waiting for permission to hunt a couple of other sites, but as I haven’t heard back I decided to go over a couple of old spots that have been gone over fairly well. There was one area that I had left targets in the ground because it is riddled with pieces of molten lead from where the blacksmith shop once stood. After some hard going and about 15 bits of lead I had my first target that actually sounded like something decent, even though it too was a bit scratchy. I didn’t have to dig too far before an 1837 farthing was once again seeing daylight probably for the first time in over a hundred and fifty years. I pushed on, chipping away at the myriad of lead bits for about another hour before I finally had an awesome signal at around 1:48 on the E-TRAC. The ground was rock hard from the hot days so I was using my pick to loosen the soil. I was actually putting the spike of the pick down the cracks in the soil and levering big, solid clumps of dirt out about the size of footballs. 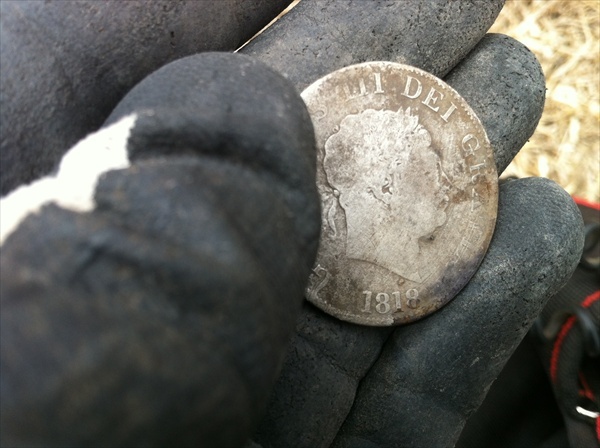 As I lifted the second lump out of the way it revealed a coin laying loosely at the bottom of the hole, I wasn’t sure what it was at first but it didn’t take long to work out it was a big silver, and what a silver it was an 1818 George III half crown. This is my second half crown in as many months so I am pretty stoked with it. On my way back I stopped in to see if the farmer was home that I have been trying to catch up with and gain permission for another site that had three stores and a factory on it. I sure am glad I did because there is no better way to top off a great hunt than to know that you have permission for your next site, happy hunting and stay positive. Recently I have been trying some different settings on the E-TRAC to try and zero in on the iffy targets. As it is only early days I am still unsure as to how I would hunt a virgin spot, although I have been surprised at what I am finding in ground that has been flogged. The only observation at this point is that there are not many silvers left after I have run my NB settings over an area, only plenty of copper coins and these are mainly 1 & 2 cent pieces (brown buggers). The changes I have made are minimal in that I am running in audio response smooth, now what this seems to be doing is giving a much more solid tone and in turn it is proving much better for the initial detection of the coin. I have also found that the tone ID appears to be much steadier and more consistent, I think this is due to the nature of the smooth tone as it is less erratic than the long setting. Now I didn’t find any coins deeper that about 5 inches which to me is a concern but it may be simply that I didn’t go over any, so the jury is still out on this one. 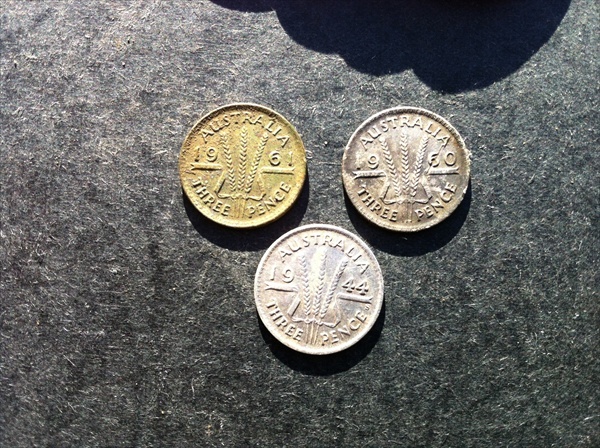 When in long I have pulled threepence’s, which are tiny little silver coins from around 13 to 14 inches in moist ground. I found that the pitch changes and is not as high as in long but I combated this by turning my limits up to 30, and for those who use long be aware that your tones are going to be a bit different. 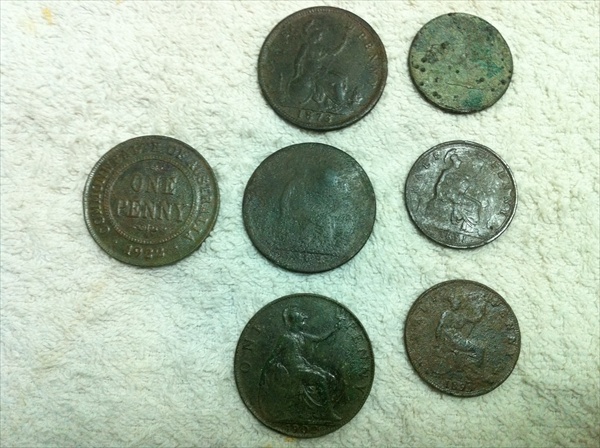 Below are some coins that I pulled from ground that has been heavily hunted, yet in smooth today the initial response from the target was more pronounced and definitely stood out more. 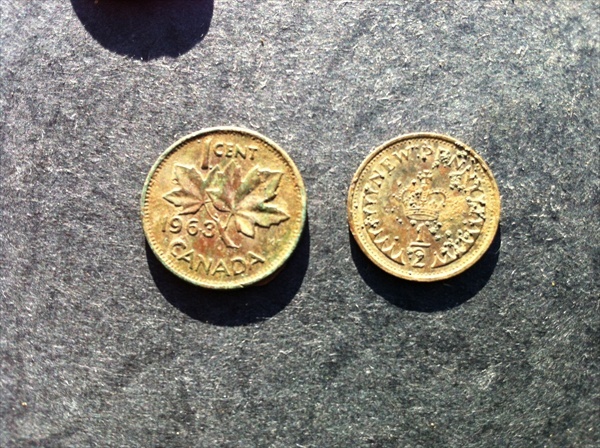 One and two cent coins, half pennies, Canadian 1 cent, new 1/2 pence and 3 x threepence. 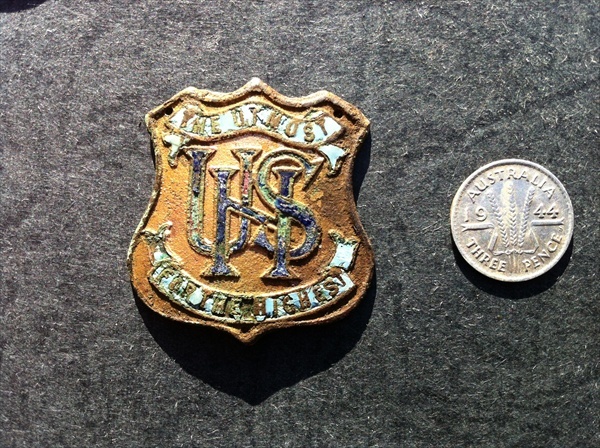 The badge is the Unley High School Logo with The Utmost For The Highest on it. So in conclusion to today’s many finds in a heavily hunted area I can only say that so far they are proving to be successful, but in saying that I think that the long setting will be my preference until I actually hit some deep targets. I will keep you posted and maybe do a couple of videos to show the advantage/disadvantages when I have tested it further. I am going to the bottomless pit to see how the new settings are because I have been over that area more than anywhere else and I feel it would be a fair test. Happy hunting and stay positive. It has been too hot to go out much and the ground has become rock hard making it difficult to retrieve targets. I was itching to get out but I could only go back to some ruins where I new the ground was sandy so digging would be easier. There was a site that I had been quite productive the first time I went there and I had left an area in the adjoining paddock because there were bulls in it. As I pulled up I scanned the area and fortunately the paMddock was empty. 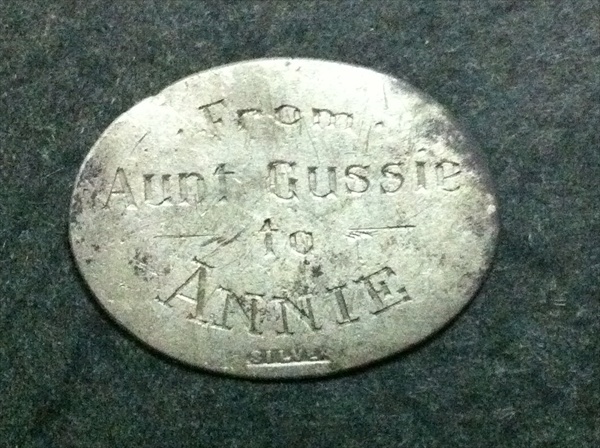 It was tough going amongst the rubbish with no silvers and only a few pennies/halves, 1868 – 1922. 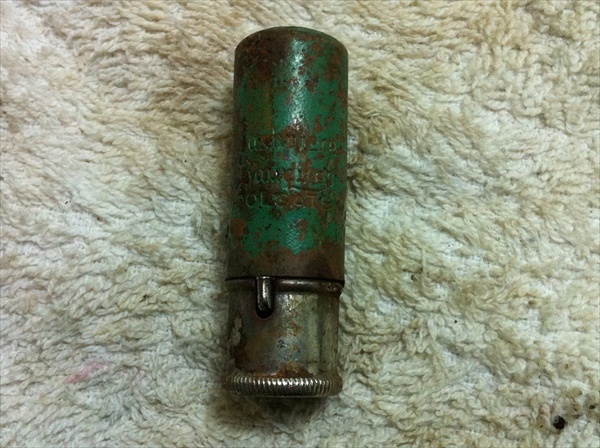 Other finds for the day consisted of a Colgate lipstick container (introduced around 1912), a 1935 dog registration disc, shot measurer and a few unknowns. I tried some different settings today with the E-TRAC in audio smooth instead of long and it was pretty good. As you can see there were not a lot of good targets amongst the rubbish but it was fun to get out there and try the smooth settings, I will be testing this further to see if it is better than audio response long or not. Happy hunting all. 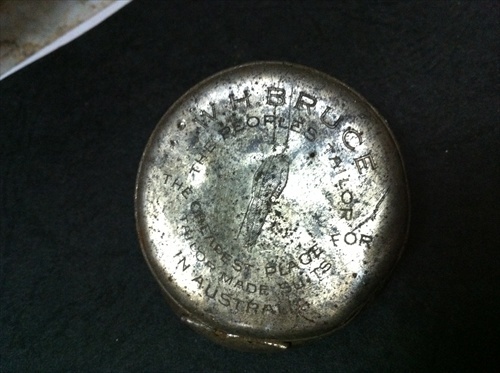 I received a reply from Krug & Co in regards to the lead cap from my post Our Finds Paint A Picture, and it turns out that it is a cap from a champagne bottle. Below is a quote from David Baines Wine Consultant to Charterhouse Auctions UK. 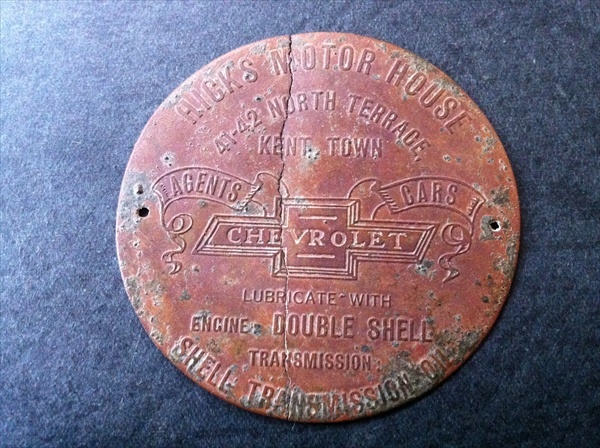 So another great relic that tells a story, I just love this hobby it is so much fun learning about history from your finds. Happy hunting and stay positive. 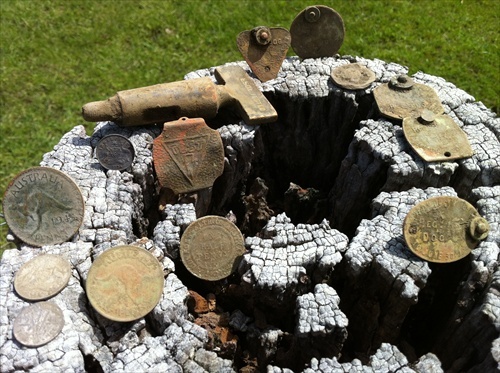 One of the most exciting aspects of metal detecting for coins & relics is bringing all your discoveries together to try and shed some light on the people that may have occupied the area. We can never know for sure because it is a lot of guess work but it sure is fun putting the pieces together. 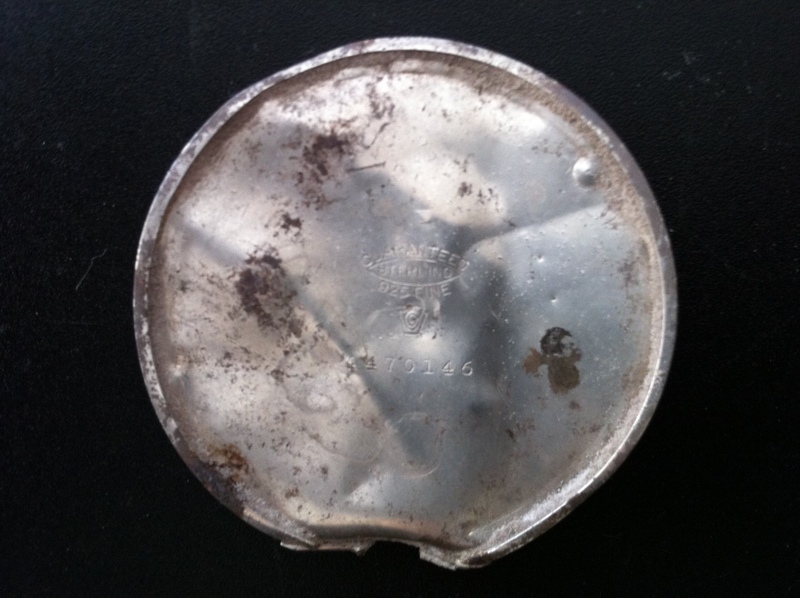 I have recently been detecting at a site where the relics have been consistently exceptional, with lots of silver items and relics that make me think the occupants were quite well off. There were also a number of buildings and remains of buildings spread out over a large area, this too would indicate that they had some wealth. 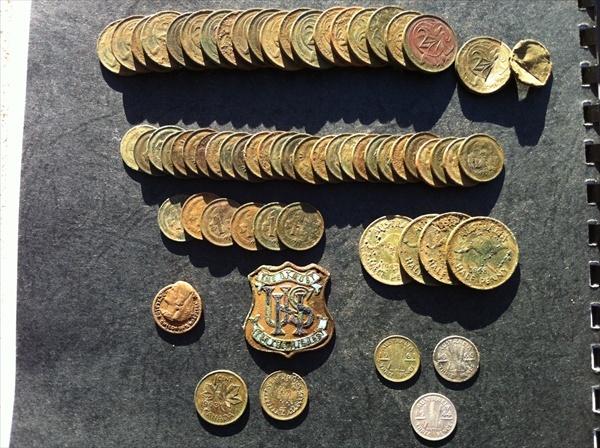 I have to admit that the coins I am finding are only old coppers, and with a site like this I was fairly confident that I would have found a silver or two, maybe even a Sovereign. 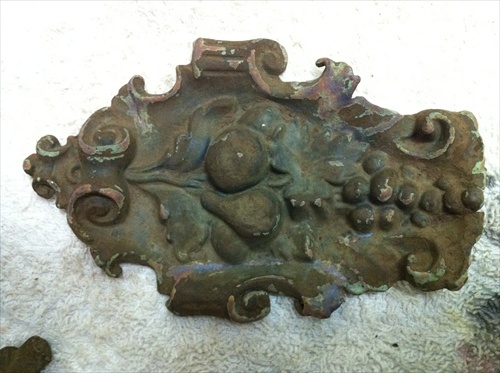 Below is a silver plaque that was probably attached to a gift. And the back off of a silver watch, both of these items could indicate wealth back in the early days of settlement. Although as I said above we can only speculate but when you start putting everything together it paints a clearer picture of what may have been. 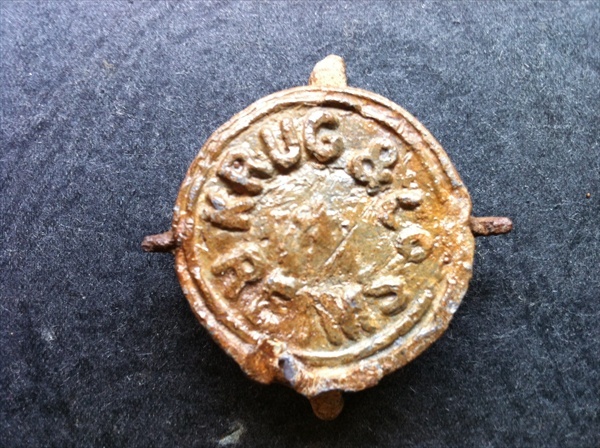 This brings me to another interesting item I found, which appears to be a lead top off of a Krug & Co Champagne bottle from Reims, France the home of champagne. I not only found one of these at this site but a second one turned up a couple of days later. I have been unable to find exactly what the item is but it is definitely from the Krug family, champagne makers during the 19th century. You would think that where there was champagne there were celebrations, dinner parties or weddings etc. Happy hunting and enjoy every hunt, keep your coil to the soil and stay positive. 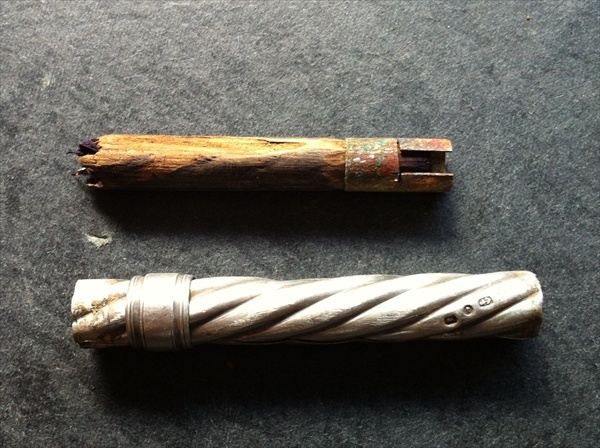 Hi all just a quick post to let you know that I have been invited to join Minelab’s Treasure Talk blog as a guest blogger. I hope you enjoy the blogs and make sure you get on and have a good read of some of the other great stories from the Treasure Talk team. 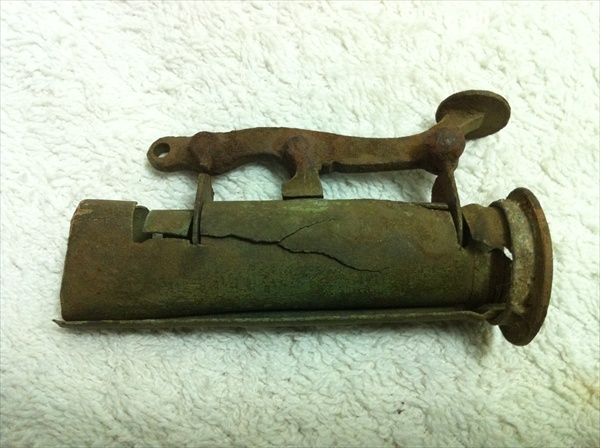 Minelab I believe have the edge over other metal detectors but don’t take my word for it, have a read and compare, and it will become apparent that the most consistent good finds are discovered with Minelab detectors. Some great finds while using the E-TRAC. Happy hunting and keep your coil to the soil because you just never know what your next swing will find. Well sometimes all the planets line up and things just come together in a way that makes me smile and understand why I put in hours of time researching. I recently found a house that belonged to one of the first whalers in South Australia around the 1840’s, after seeking out the owner and receiving permission from Him I couldn’t wait to get started. My first trip to this spot produced some awesome relics including a relic that is usually only found in the UK, but you will have to wait for that story to be published in the Gold Gem & Treasure magazine in a couple of months. However my second trip back was pretty amazing as well, again producing plenty of relics and a few coins but it is the quality of the finds at this site that is what I like about it. It is a large area and there appears to be targets spread all over the place, but today I found myself concentrating on an area that was where they dumped all their rubbish. There was one spot when I turned the dirt over out from the shovel that contained five or six relics, including a watch that says W H Bruce on it, unfortunately I can’t find any information about it. 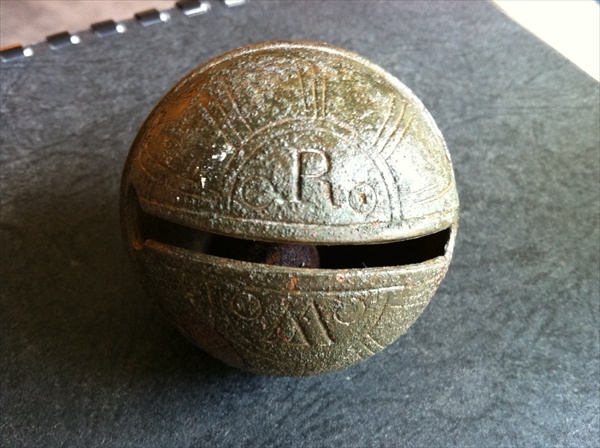 When I was detecting here the first time I found a Silver pencil holder with the hallmarks references being 925 silver, 1893, Birmingham and maker was Villiers & Jackson. Relics like this are often attributed to people that would have been quite influential and wealthy, so it makes for an exciting hunt. 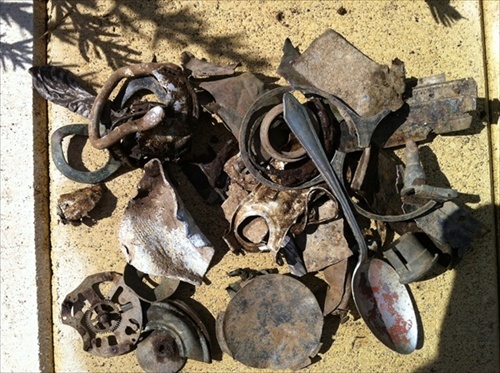 There was no shortage of targets today because this site has bits and pieces of copper, brass and lead strewn all over. I want to point out that when you hunt these old sites it is not just a matter of rocking up turning on your detector and the coins and good relics just jump out of the ground. If you look in the picture below that was from the first hunt (i dug more junk than that today), you will see a multitude of junk but the only problem is that they sound good so you must dig them. Sometimes they will even be masking a better target that is in close proximity and after removal you may get a nice surprise when you run your coil back over the spot. 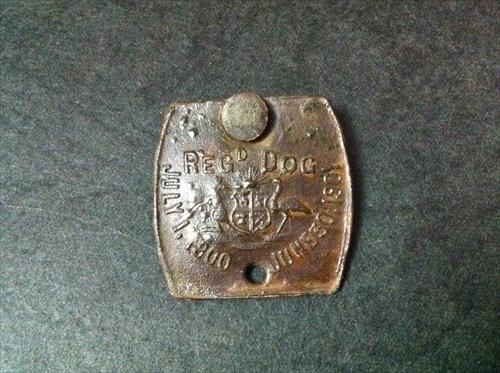 I found another five dog registration disks today ranging from 1889 to 1938 and these were scattered throughout the area that was their dump site. Make sure that when digging these dump areas that you are really careful because they often have heaps of broken glass, as was the case today and you never know what you could find because some of those old bottles are worth a few bucks. 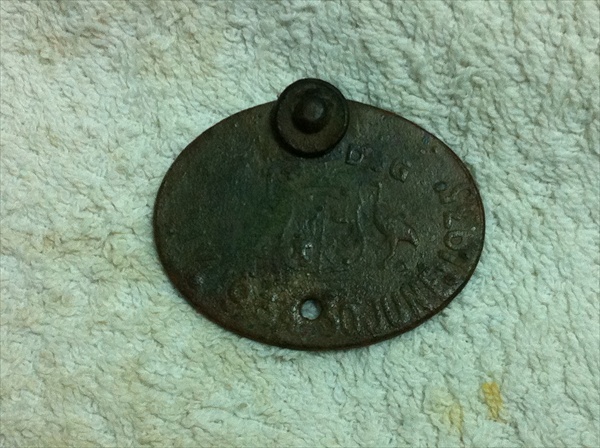 This brings me to my best find for the day and if I had realised what it was when I found it I would have taken a bit more time detecting around to see if I could find the other half. 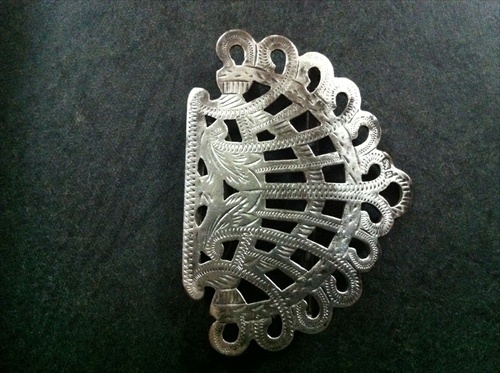 Below is half a silver nurses buckle that where traditionally given as a graduation gift to a nurse when they qualified. 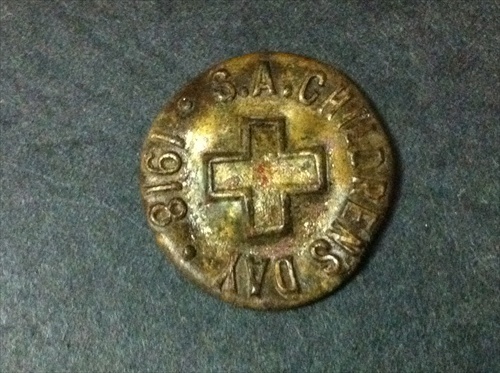 I have to add in this button that I found but again unfortunately there is no information to be found as yet. I hope you enjoy this and it encourages you to dig deep and find some great spots to dig up some history for yourselves, happy hunting and stay positive. Well had a bit of a break over Christmas and haven’t been for a hunt for 4 days, it feels like the universe is all out of whack. I am heading out today, armed with a heap of new locations and plenty of time, although it is still really hot here (over 100 degrees again today). So I hope you all had a great, safe and happy Christmas and that the New Year brings you happiness and health and plenty of great finds. So stay positive and keep your coil to the soil.